Da Capo Press, 9780306809699, 624pp. Newsday has said that Nick Tosches "casts brilliant black light." The San Diego Reader has said that "Tosches's best sentences uncoil like rattlesnakes and strike with a venom that spreads poison through all the little Sunday-school ideas you've held dear." And Rolling Stone has said that "Tosches can write like a wild rockabilly raveup. He can be elegant as a slow blues." 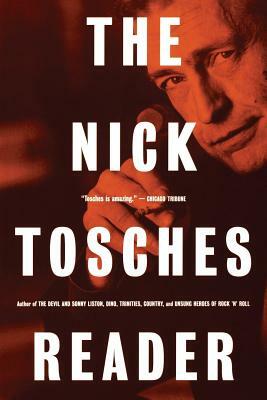 The Nick Tosches Reader is the author's own selection of his best work over the past thirty years, including fiction, poetry, interviews, rock writing, investigative journalism, and criticism. First published in major magazines, obscure underground periodicals, and his own best-selling books, many of these selections deal with rock 'n' roll and cultural iconsbut there are also pieces on everything from William Faulkner to organized crime to heavyweight boxing, including the Vanity Fair feature that gave rise to Tosches's major new book on Sonny Liston, published by Little, Brown. Here is "a unique and darkly impressionistic cultural history" of the last three decades as only Nick Tosches could write it.